Haven’t decided on a hotel yet? 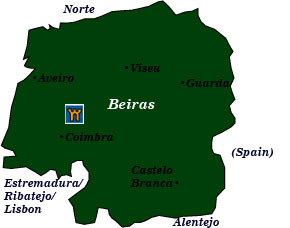 You can look at other available hotels in the Beiras region with Booking.com. In the heart of Portugal, the Beiras region stretches across three provinces—Beira Litoral, Beira Alta, and Beira Baixa—each offering an enormous range of diversity. Alpine meadows and forested hills mark the Serra da Estrela, Portugal’s highest mountains. To the east, a line of castles and walled towns once provided protection from the Spanish, and to the west, icy streams cascade down to the coast where noble castles look outward to the Atlantic Ocean. Once part of Lusitania, Roman ruins are evident in well-preserved ruins. The Moors later claimed the area, leaving their unmistakable influence on castles and fortifications. Throughout the Beiras region you’ll see wonderful examples of Portugal’s unique Manueline art and architectural style. Highly decorative with maritime overtones, this style developed as a result from the wealth brought back from the New World. Coimbra With a romantic setting immortalized by poets, atmospheric Coimbra was Portugal’s first capital and a royal residence for centuries. Known as the “Oxford of Portugal,” its ancient university is still the country’s most prestigious. The Velha Universidade, or Old University, overflows with cultural treasures, starting with one of the world’s beautiful libraries, the dazzling Biblioteca Joanina. The university is listed as a UNESCO World Heritage Site. Coimbra’s granite and crenellated Sé Velha, or Old Cathedral, looks like a fortification because it was built in the 12th century, a time when the Moors still posed a real threat to security. Museu Machado de Castro Housed in a former palace this museum holds an outstanding collection of sculptures, paintings, and decorative arts. Roman ruins of Conimbriga This archaeological site dates back to Celtic times, but its Roman ruins are the best preserved in Portugal. Just 16 km (10 miles) southwest of Coimbra and worthy of an excursion. Mata Nacional do Bussaco (Buçaco) This National Forest was once a religious sanctuary forbidden to women. Now, visitors come to enjoy trails that pass by several hundred species of trees, ferns, ponds, ancient chapels, and the amazing Palace Hotel do Bussaco. Serra da Estrela Portugal’s highest mountain range is home to the Parque Natural da Serra da Estrela. Ski enthusiasts will find facilities in the winter months, and hikers will find ideal conditions between May to October. Just outside the park, the town of Guarda boasts a fascinating, fortified sé, or cathedral, complete with gargoyles and flying buttresses. Fortified villages Day tours can be made to: Belmonte. (Built in the 13th-14th centuries, its castle sometimes hosts concerts in its amphitheater); Pinhel, which has the ruins of a 14th-century castle above the town; Castelo Rodrigo with its citadel; Almeida, now a national monument, boasts a star-shaped fortification with a moat; Penamacor holds the ruins of a 13th-cerntury castle with a great view; in a dramatic setting, stunning Monsanto has prehistoric origins and the ruins of a 12th-century Knights Templar castle; and Sortelha is a charming, 12th-century walled village with the remains of a small castle.